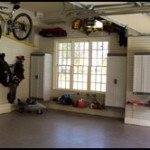 It’s important to recognize that coating your garage floor isn’t as simple as slapping on a coat or two of the stuff the Big Box Stores will sell you – not if you want an attractive, envy-of-your-neighborhood, long-lasting, durable, low maintenance garage (or basement) floor, that is. 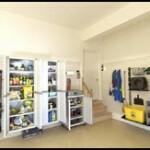 To do it right the first time is often beyond the scope of the home handyman (or woman). 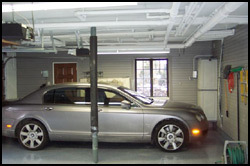 and our goal at TLC Garage Works is to install a top quality, surprisingly economical floor coating that will provide years of great-looking, stain-resistant service to you and your garage. As professional installers we have an incentive to take lots of extra care since we’ll be giving you a much longer warranty than the do-it-yourself products retailers will sell you. 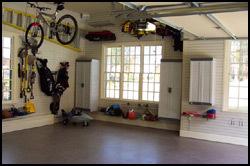 As much as 75% of the cost of having your garage floor refinished should be directly related to preparing the floor surface. Done poorly – or not doing it all – will invariably result in very poor adhesion, premature coating failure, and your disappointment. And since over 80% of premature coating failures can be directly linked to inadequate surface preparation, we’ll need to take the time to prepare your floor well. before we apply the coatings. Done properly, this ensures you get an exceptionally solid, strong bond between the concrete and coating. and many, many years of useful service and satisfaction. 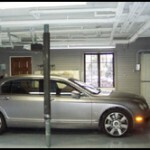 Our professional installers will carefully evaluate your garage floor or concrete surface. 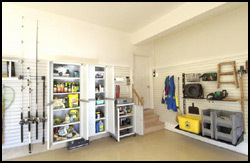 and if we find minor cracks, or oil, grease, wax, or paint stains, we’ll repair, prepare, seal and coat the surface with products selected specifically for your unique requirements. Cracks, holes and eroded areas – to provide a more stable, secure surface, we’ll open up and clean out any cracks or erosion with a diamond grinding wheel, fill them with a 2-part, polyurea elastomer crack welding compound, then grind them smooth after the repair cures. We may also use grease lifters and/or soy-based products to remove all traces of oil, paint, wax, polish, or oil stains, carpet mastic, etc. 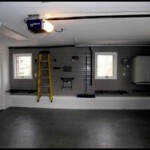 If your garage floor is unfinished, and your home was built in the last 20 years, it’s likely the floor was treated with a power troweling machine when it was originally laid. This smoothed the surface, forcing the aggregate (sand and small stones) deeper into the concrete, resulting in a smooth, even surface. Unfortunately such surfaces are generally too smooth for the floor coating to reliably bond with. 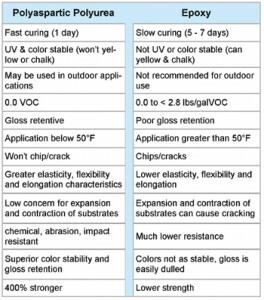 Since coatings adhere better and more reliably to a rough surface, the relative roughness is the most important consideration as we prepare your floor for coating. How Do You Roughen the Concrete Surface? 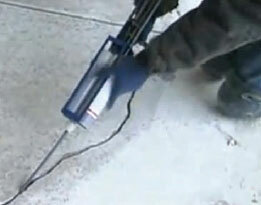 There are two primary ways to roughen the concrete surface. using an acid etch, or machine grinding it. Acid etching – involves applying an acid solution (usually muriatic acid) which, when applied, reacts with the concrete, eroding or lightly pitting the surface. Because it’s relatively easy and inexpensive, many contractors recommend acid etching to prepare the floor. 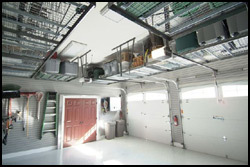 Similarly, the do-it-yourself garage floor kits from the Big Box Store usually include an acid etching component. It cannot roughen the concrete enough – remember – the greater the roughness, the better the adhesion. It often leaves a residue of ‘acidic slime’ – and this slime is often worse than doing no preparation at all. It introduces water into the concrete – and water is the enemy of nearly all coatings, in that it prevents good adhesion. Some companies try to remove it with fans. but concrete retains moisture long after the surface appears dry. 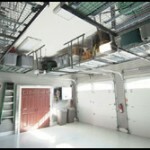 The primary benefit is its low cost – to the contractor. In other words – it leaves extra money in their pocket, not yours. Bottom line… acid etching doesn’t provide the ‘tooth’ required to ensure the solid, complete bond we strive for in our projects… and which is necessary for a dependable, trouble-free floor. Mechanical grinding – generally done with a walk-behind machine which uses one or more rotating plates coated with industrial-grade diamond grinding surfaces. The operator controls the degree of roughness to ensure the surface is ideal for a solid, well-bonded coating. Mechanical grinding offers the best, most consistent roughening, producing a coarser surface, and leaving no residue or moisture behind. While it takes more time than acid etching, it’s a far superior way to prepare the surface. 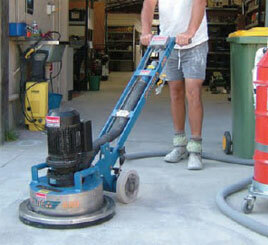 TLC Garage Works will only use mechanical grinding as the primary method for preparing concrete floor surfaces. and that’s just one of the many reasons a TLC Garage Works installation results in the most attractive, durable floors available anywhere. 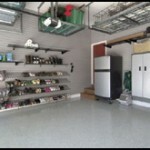 There are several different coatings being used for garage and other concrete floors. paints and stains, epoxy, polyaspartic polyurea, and whatever the flavor-of-the-month is for the Big Box stores. Trapped moisture will activate lime & alkalis which attack the finish by ‘saponification’ (fatty acids in paint turn into soap). New concrete is highly alkaline so the saponification effect is accelerated. The surface film tends to easily wear off/chip off in traffic areas. 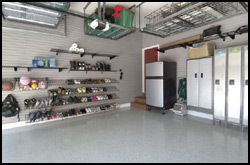 When epoxy was first introduced nearly 30 years ago for garage floors, it was a revolutionary improvement over the historic concrete paints and stains… and for the better part of those 30 years – when professionally applied – there’s been nothing to compare with it. 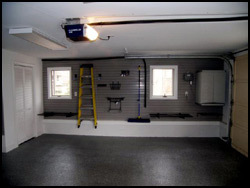 The most significant drawback to epoxy garage floor coating was how long it took to install and cure before the garage could be returned to service and fully utilized. Those days are now long gone. 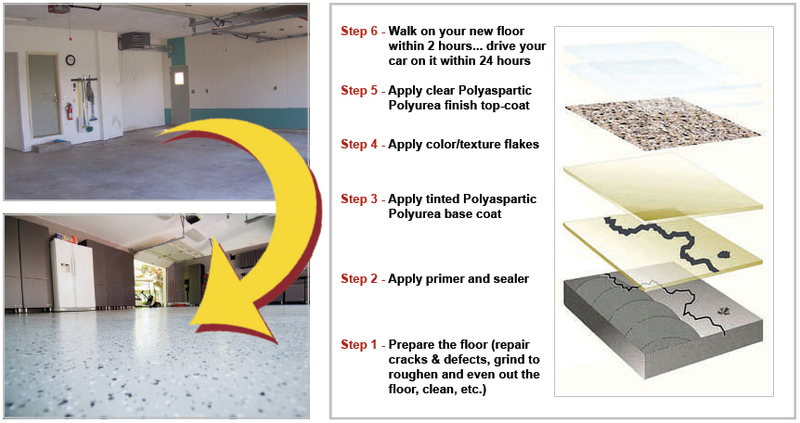 thanks to the introduction of the new, fast curing, incredibly durable Polyaspartic Polyurea catalytic floor finishing systems. Applicable over zinc, epoxy, urethane, and aromatic polyurea. 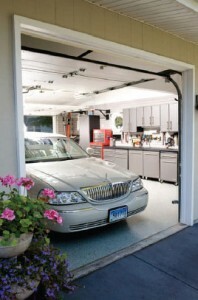 You’ll love your new TLC Garage Works garage floor. 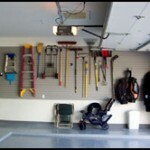 And while you’re at it… why not consider a complete garage makeover? We can do it for you. 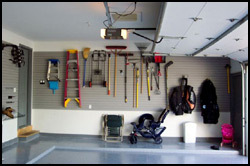 in addition to your new floor, we’ll organize your garage – from clean-up, taking your ‘junk’ away, installing slat-wall, new storage systems, and leaving it sparkling…and you’ll be glad you did!